Say hello to sweet Bailey! This beautiful girl is 13 and recently has been showing signs of pain and discomfort. She has been dragging and tripping on her front leg and just not acting herself. She has been lethargic and low energy and not jumping into the car. Bailey has been under chiropractic care for a good portion of her life, so before doing anything too drastic, her family opted to get her adjusted! Bailey was stiff and lame at her first visit, but the spasm in her neck indicated it was likely a pinched nerve stemming from this region. Her range of motion was limited and she wasn’t wanting to do a full body shake. After two adjustments this was almost completely remedied. Bailey was full of energy and able to hop on into the car without a whimper. The limping was present but not nearly as prominent as it was in the beginning. By her third adjustment Bailey’s spasm had nearly disappeared and her range of motion was almost normal in her neck. Bailey may be considered a senior dog by her age but don’t let that fool you. Her arthritis won’t keep her down and we certainly weren’t going to allow a pinched nerve do that to her either. We are so glad Bailey is doing so exceptionally well and we love this girl to pieces! Meet Lucy! 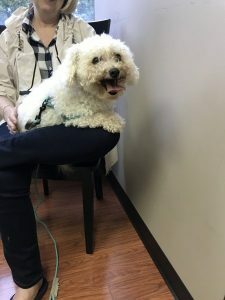 Lucy is a senior Bichon that started coming to see us because she was dragging her back legs and had some significant arthritis. Though she was older, her mom knew it didn’t make sense for her to be in so much pain. Lucy walked as if she was a little drunk and her back legs crossed over one another from time to time. This was also concerning for her mom, as it seemed like she was showing symptoms of something more serious than arthritis. After meeting Lucy and giving her a once over, she definitely was exhibiting symptoms of a pinched nerve, possibly even a minor disc bulge. She was uncomfortable and lower energy. Lucy did great getting adjusted and her mom was perfect at following her treatment plan. We first saw Lucy twice a month until she was out of pain (which took about two visits! ), after that we started seeing Lucy less frequently as her adjustments were holding. Now, we see Lucy about every 6-8 weeks depending on her activity level. After seeing Lucy this last visit, her mom told us that she is now doing stairs again and jumping on furniture, both things she has not done for over two years. She also doesn’t have any pain, her legs don’t drag, and she hasn’t tripped over herself since coming to get adjusted. Lucy was showing signs of the beginning stages of a disc problem, which can become quite serious. Her mom was proactive in getting her adjusted and now Lucy has more energy than she did two years ago. Pets are truly wonderful at hiding their pain and discomfort, so it’s always a good idea to get them checked out for prevention’s sake!